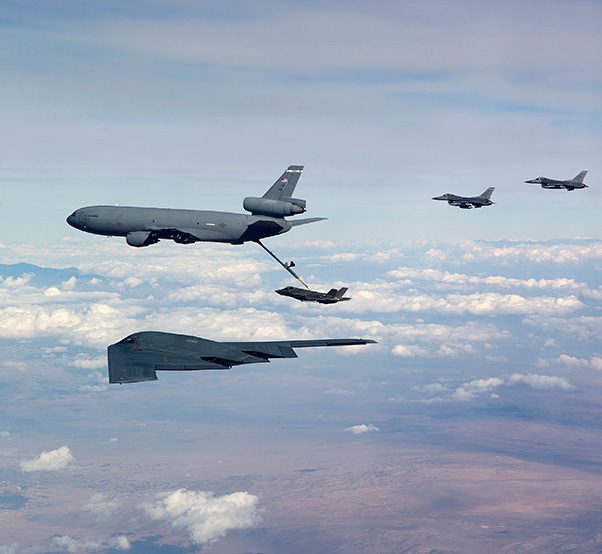 A KC-10 Extender refuels an F-35A from the 461st Flight Test Squadron, Edwards Air Force Base, Calif., while a B-2 stealth bomber (bottom) and three F-16s wait their turn in this recently released photo. The planes were on various test missions when they all flocked to the KC-10 to refuel in midair via the tanker’s boom. The B-2 is from the 419th Flight Test Squadron and the F-16s with the 416th FLTS.